Those in the “sandwich generation” are opting to take in their aging parents to save on the cost of assisted living while eliminating the extra time it would take to manage more than one household. As a Solo Mom, when discussing the possibility of moving your parents into your home, there are many things to consider. Depending on their ages, most children are able to help care for their elderly grandparents. Whether they can help their grandparents walk to the dinner table, read them a book, drive them to an appointment, or help them with some shopping, being involved in the process of caring for their grandparents will likely help your children connect with them in a new way. Even your toddler can get involved by bringing them a glass of water. 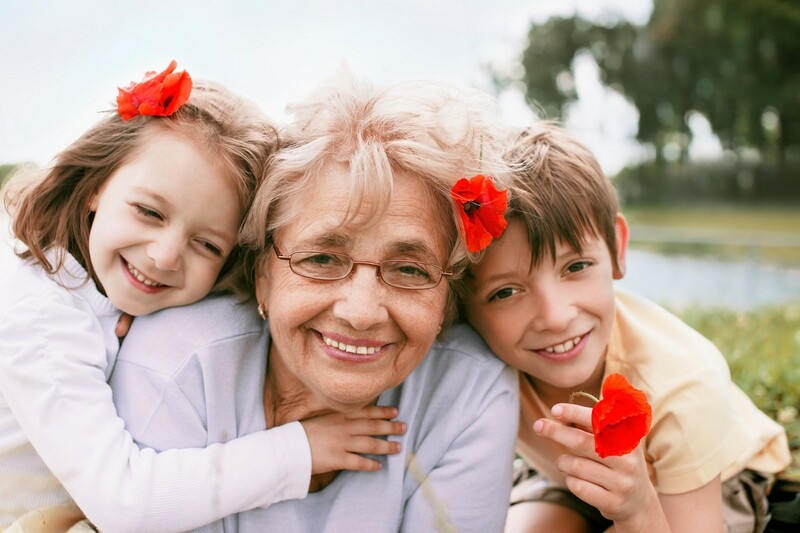 Although allowing your children to be involved might help them bond with their grandparents and feel more secure, when bringing your aging parents into your home, keeping your children’s engagement with them age appropriate is important to consider. Your children may become agitated by witnessing a grandparent struggle with health issues if they are exposed to more than they are ready for. There are ways to create a safe space for your child to feel comfortable, so keep that in mind when trying to find the appropriate balance. There are some great resources and websites that can help your family with coping strategies, especially if your aging family member has Alzheimer’s or dementia. Anyone who has been through something similar can tell you that this is one of the more difficult scenarios for a family to deal with, so if this applies to what you and your family are going through, be sure to visit the Alzheimer’s Association for ideas on how you and your kids can healthily manage your day-to-day life before you decide to bring your aging relative into your home. Aging doesn’t always manifest with a rapid decline in health, as Dr. Marion Somers, an elder-care expert and author of Elder Care Made Easier (Addicus Books, 2006), also explained to SingleMindedWomen.com. She said, “The immense responsibility of caregiving doesn’t always hit you at once. . . . It’s much like a very slow-moving snowball effect. It starts with small things like helping the person with laundry, grocery shopping, or bills, but if not monitored, all these smaller tasks can add up to one very overwhelming caregiving situation.” So be prepared for a longer, drawn-out process in some cases. Also, remember that if you are planning to be the primary caregiver, having your parents in your home will help save you time commuting or managing two households. You might need in-home care and other services for increased care needs. Make sure to have a plan and services in mind in case an emergency arises. Are my kids going to act out? If you are under extreme pressure from the many responsibilities you’ll be taking on, your children might feel that energy and could react to it. They might get angry and feel ignored because your attention is often elsewhere, and they may express sadness about the changes their grandparents are experiencing and worry about what is going to happen. Try to alleviate as much of the stress as possible from the start by having a plan that encourages you and your family to live in a communicative and empowered environment. Being prepared in the case of an emergency can ease your family’s anxiety so you don’t feel as if you are living from one crisis to the next. Start with the basics: Do you have backup? Someone who can come help you with laundry, meals, and cleaning? Help you with your children and/or your parent? Do you have any finances put aside in case you need to hire an in-home nurse or extra child care? Assemble a list of potential helpers, and put it on the fridge. Include all the doctors, nurses, and other medical numbers you may need, as well as those of your local hospital and pharmacy. Have you read all your medical-insurance benefits and those of your parents? Take a very good look at all the benefits you have. Your parents may be entitled to in-home nurse visits, physical therapy, and medical equipment, among other benefits, that might help create a safe and comfortable living situation in your home. Consult a tax adviser to ensure you are taking advantage of all your appropriate tax deductions, including claiming a parent as a dependent or deducting care-related expenses. You may be entitled to a loan, line of credit, or second mortgage. In addition to tax credits, you or your parents may be eligible for grants, such as the Residential Rehabilitation Assistance Program for the disabled, supplements for low-income seniors, and veterans’ funds. How much will it cost me to care for my aging parents? Money is a huge deciding factor for a Solo Mom when making big decisions in general, and now with the impending decision to bring your parents into your home, you are likely wondering how you’ll be able to afford it. Have an open and honest discussion about money and costs with your parents, and make a list of all proposed expenses you will have. Talk to your parents about whether or not they can help contribute to the monthly family bills and how, whether it be a lump sum or paying directly for specific care, the mortgage, rent, or other bills. Document what you estimate the incurred costs will be, and if you have siblings, talk to them about your expectations and theirs regarding their support in terms of their time and financially. Do I need to move? Where are they going to live? Having your parents move in to your home could be seamless if you have the space and appropriate conditions to complement their current physical state. If you are facing the probability of needing to modify or move because your current home is too small or doesn’t suit the needs of an aging parent, look at what it will take to create a safe and comfortable arrangement for everyone, including you and your children. Does your home have stairs that will make it impossible for an aging parent to move freely around the house? Can you equip your bathroom with safety rails or anything else your parents might need? Do you have a private space on the ground level that your parents can use as a bedroom? These important questions will help you decide if you need to move, reconfigure your home, or make appropriate adjustments to your current space. It is common for the family caregiver’s health to suffer and for this person to therefore be at a greater risk for burnout. It can also be very hard on the family dynamic as your aging parents become more reliant on you, their grown child. As a Solo Mom, you will need to be especially aware of your time, your health, and how being a caregiver for your parents affects your children. Do you have a flexible work schedule? Are you ready or able to cut back on work hours in case your parent requires extra assistance, or do you have someone who can help with these care needs? If you are working full time and have young children, be sure to carefully weigh your situation and the situation of your aging parent. On the flip side, your parents may still be well enough to help with child care, meal planning, household chores, and more. The free child care alone can offset a huge amount of stress and financial burden, and your time will be more flexible having a few extra hands around the house to help with the chores and daily tasks. Caring for an aging parent can require a lot of extra time. Is there anyone in the area—family, siblings, or a good friend—who can assist you in caring for your parents? Assistance can include financial help, help with child care, or help with other things you might need. You can also look for local nonprofits that provide care for the elderly. These nonprofits offer a variety of services, from entertainment to meals to home care. A successful relationship will involve partnership. Be honest about the strain or stress on the family dynamic and your children. Make sure that a professional conducts independent assessments of your parent at regular intervals. This person can determine if living in your home is still appropriate for your parent. There are so many choices and decisions to make when considering whether to have your aging parent move into your home. Solo Moms have the extra burden of a single-parent income and being the primary caregiver for their parents. Weigh your options carefully. Aging parents who are healthy and active may be a welcome addition to your household. If you carefully weigh your situation at home, how the mobility and health of your parents might affect the lives of you and your children, and what is important to you in the care of your aging parents, then chances are you will be better able to determine a path that works for all.